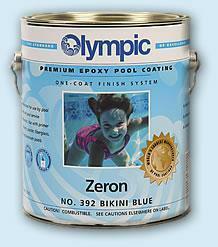 The ZERON system is the longest lasting epoxy pool coating available. You can expect up to eight years of service from one application of this product. The greatest advantage of the ZERON system is that it only requires one coat. ZERON is a heavier bodied material than POXOLON 2 so it will require a little more effort in its application and will not spread as far. However, due to the extremely long life of ZERON, the cost per year of service is lower than any other pool coating available. This coating may be applied by roller or airless spray equipment. ZERON is highly recommended for professional pool builders and pool service companies as an alternative to traditional pool plaster. The finished surface will stay brighter and will be easier to keep clean than a plastered pool. Coverage: Approximately 125 - 150 square feet per gallon. Available in these attractive colors: White, Blue Ice, Bikini Blue and Blue Mist. 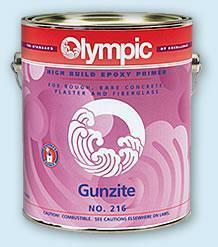 GUNZITE is a two-part epoxy primer for application over fiberglass or unusually rough plaster or concrete. The heavy viscosity of GUNZITE acts as a fill coat on concrete and plaster and provides a much smoother surface, GUNZITE should only be used as an undercoat for POXOLON 2 or ZERON. Especially effective on sandblasted surfaces. POXOLON 2 is a high gloss epoxy pool coating that is easy to apply and should yield up to five years of service. This finish is very easy to clean as is the case with all epoxy pool coatings. 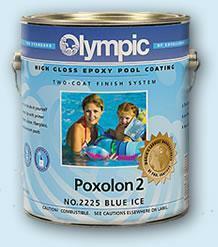 You may use POXOLON 2 on most conventional pool surfaces with excellent results. Uncoated pool surfaces will require a prime coat to insure good adhesion. Recommended for use by pool service companies and the do it yourself pool owner. 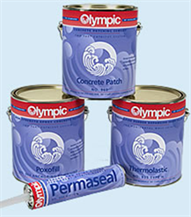 Use with primer on concrete, plaster, fiberglass and metal pools. Two finish coats of POXOLON 2 are required in all cases. POXOLON 2 may be applied by either airless sprayer or roller. Coverage: Approximately 225 - 250 square feet per gallon. Available in these attractive colors: White, Blue Ice, Blue Mist, Bikini Blue, Viking Blue, Spanish Blue, Sunshine Yellow, Red Pepper, Black, and Clear. HYDROLON is a water-reducible acrylic enamel designed for fast easy application on bare concrete or plaster and over an old rubber base finish. 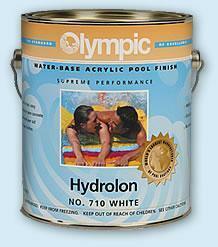 HYDROLON can be applied to damp surfaces and has no solvent vapors. The unique properties of HYDROLON make it perfect for seasonal commercial application or for use in indoor facilities. Two coats are required but a third may be necessary for unusually porous bare surfaces. Coverage: 250 - 300 square feet average per gallon. Available in these attractive colors: White, Blue Ice, Blue Mist, Bikini Blue and Black. Clean your pool surface without the extra steps of traditional cleaning. 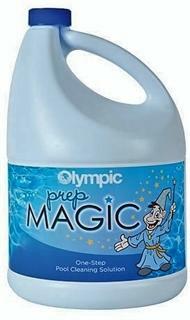 Olympic PREP MAGIC (245) is a one-step, clean and etch pool surface preparation solution that allows you to clean your surface without the extra steps of traditional surface cleaning. Simply mix PREP MAGIC with water, clean your surface, and then rinse. glass, plaster, and painted surfaces. Coverage: 400 square feet average per gallon. No. 950 PERMASEAL is a nitrile rubber caulking compound for repair of small cracks. Remains permanently flexible. No. 962 POXOFILL Poxofill can be used for permanent patching of concrete for a strong, lasting bond. Also used for anchoring diving boards, ladders and resetting tile. No. 960 CONCRETE PATCH is a strong yet economical concrete patching compound - used for both above ground and underwater concrete surfaces. Stronger than concrete. Helps provide sure footing to worn out diving boards. Each Diving Board Kit contains one quart of Super Convoy, one pint thinner, one roller cover and complete instructions. Can be applied to fiberglass, aluminum or wood with excellent results.